Order your copy of Will I Ever Be Free Of You? today from these online book retailers. Available in hardcover, Kindle and audio. An expert's checklist for gauging where you stand. Below I'm offering you a checklist to determine if your relationship carries these devastating traits. Remember: Narcissism is a spectrum disorder; someone with a high level or number of these traits can be a more damaging influence on you and your children. The more traits, the closer to a full-blown personality disorder. 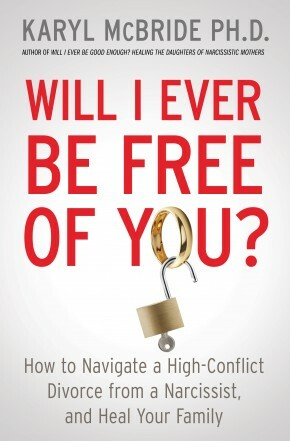 This checklist is copyrighted and comes directly from my new book: Will I Ever Be Free of You? How to Navigate a High-Conflict Divorce from a Narcissist, and Heal Your Family. Author of the bestseller Will I Ever Be Good Enough? Healing the Daughters of Narcissistic Mothers, Dr. Karyl McBride draws on her expertise in treating children and partners damaged by narcissists in this practical new guide to divorce and its aftermath. Dr. Karyl McBride draws on her expertise in treating children and partners damaged by narcissists in this practical new guide to divorce and its aftermath.